Everyone loves getting a new car and one of the things we look forward to most is that new car smell. Unfortunately, it doesn’t seem to ever last quite long enough. 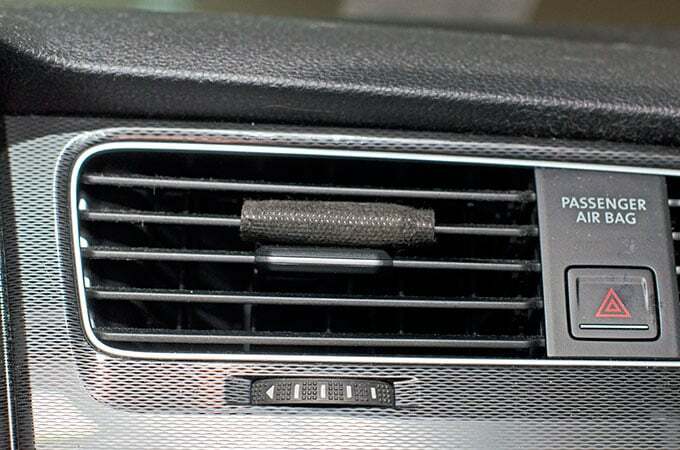 Check out these tips for how to keep your car smelling good no matter how new or old it is. Keep a trash can in your car, but don’t let your car become the trash can. Many of us are in our cars pretty much every day, so it’s no surprise that trash ends up in our car. I’ll admit we’ve had those super busy times where the back seat ends up being like a trash can between fast food bags, leftover plastic grocery bags, mail and the like. However, leaving all that “stuff” in your car just leads to a stinky car in no time. Instead, I now keep a small trash can or a plastic or paper grocery bag in the car to collect all the trash in. Then when I get home I just toss the bag or empty the can into the larger trash can in the garage for a mess-free car with no stinkiness. Be aware of what you’re doing in your car. Since we spend a lot of time in our car, we of course also do a lot of things in our car other than just driving. If you’re doing things like eating, smoking in your car or hauling around the kids and pets who are likely bringing in messes of their own, your car can quickly get stinky. As such, be aware of what you’re doing in your car so you know the hard-hit areas to concentrate on for #3. Regularly clean your car. Once you know the highest traffic areas of your car, be sure to clean those areas of your car regularly. I like to regularly vacuum out the car and make sure there aren’t any random wrappers strewn about. You may also want to steam clean your upholstery regularly, especially if you have pets or there have been dropped drinks, muddy shoes and the like in your car. Keep check of your car’s condition. Unfortunately, over time our cars break down and there may be mechanical issues that can actually lead to various smells in your car. Also be aware of any holes or dents in your car that may be harboring water which can lead to a musky mildew smell. When possible, try to not park in the sun as the heat can make odors set and be harder to remove. Use PERK Vent Wraps. I’m the kind of person that always likes to smell something good whether it’s just a simple clean scent or one of my favorite scents, like vanilla. 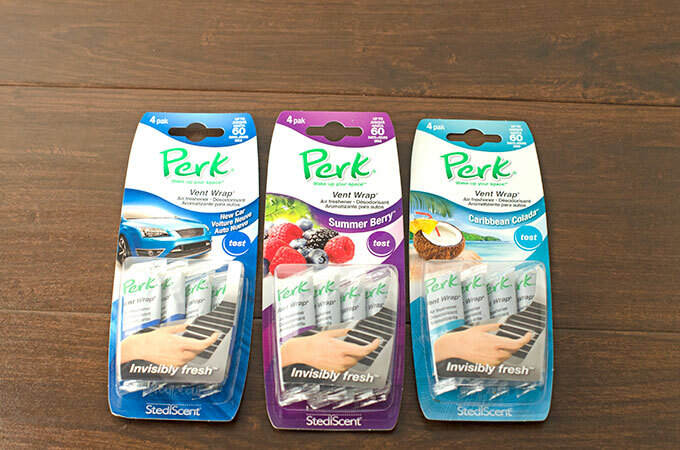 As such, I love using PERK Vent Wraps in our car. 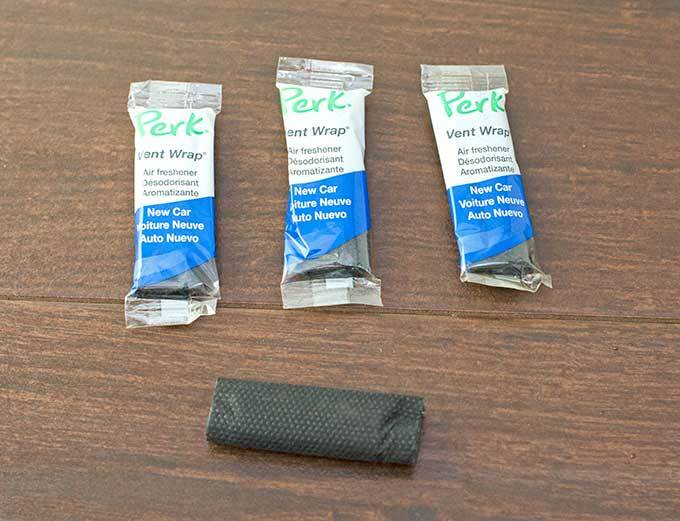 Why Use PERK Vent Wraps? I love that with a quick glance you don’t even really notice the PERK wraps! Giveaway is open to legal residents of the 50 United States + DC who are the age of majority in your state. Prizes cannot be shipped to PO Boxes. Giveaway closes at 11:59 PM ET 10/7/2015. Winner will be notified via email and must confirm their win within 24 hours. Smart Savvy Living is not responsible for any prizes or shipments. All entries must be completed via the Rafflecopter widget below. See widget for full details and rules. Do you use any of these tips for How to Keep Your Car Smelling Good? I struggle to keep my car smelling fresh because of all the stinky, sweaty sporting gear from my teenage sons and their friends. The worst odor is my husband’s cigarette smoke. We deal with tobacco odors and sweaty karate equipment! we deal with food odors even afetr the food is gone! We deal with cigarette smoke in our vehicles. The only bad odor in my car is cigarette smoke. I make sure the fast food bags are thrown away immediately.